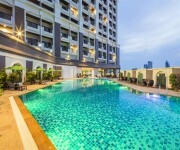 Find all the latest, best new hotels in Pattaya, Thailand that have opened in the last few years in this popular beach resort, located just a couple of hours drive away from the capital, Bangkok. This new all villa resort is due to open in mid April 2019 and is located south of the city, close to Bang Saray beach, offering 59 one and two bedroom villas, each with their own private pool. 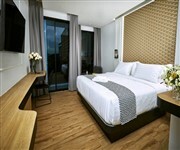 A new, good value hotel located along Sukhumvit Road in North Pattaya, opened in late 2018. 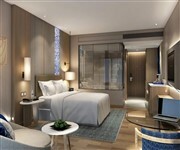 Opened in October 2018, this new luxury hotel in Pattaya offers a total of 396 guestrooms and suites. The property features a water park, entertainment zone, kid's club, amphitheatre, sky bridge, fitness centre, spa and a range of food and beverage outlets. 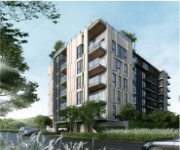 A new luxury beach resort in Pattaya, offering a range of accommodation from deluxe rooms to beachfront pool villas. A recently opened new beach hotel, located on the Pattaya - Naklua beach, offering 121 guestrooms and suites, an outdoor pool, gym, beach bar and bistro restaurant. A new hotel on Jomtien Beach, Pattaya, this 4 Star beachfront property offers 64 guest rooms and suites, a rooftop swimming pool, gym and an on-site restaurant and bar. 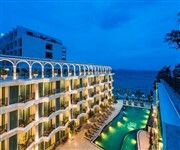 A recently opened, new deluxe hotel in Pattaya city centre, located close to Harbor Mall and Foodland. 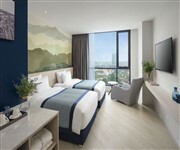 A new 4 Star beach hotel in Pattaya opened in July 2018, offering 105 guestrooms and suites. A new 5 Star hotel in Pattaya opened at the very end of 2017, this 30 storey high-rise property is located along Na Klua Road and offers 448 guest accommodations, the majority, with a sea view. Facilities at the hotel include a couple of on-site restaurants, two bars, a ballroom, function rooms and an outdoor swimming pool. This new hotel close to Walking Street in Pattaya offers a total of 510 guest accommodations, housed in 5 different buildings. Facilities at the property include two restaurants, a Club Lounge, Spa and Salon, Lobby Bar, Mini Theatre, a gym, kids play area and a large swimming pool. A new luxury resort in Pattaya opened in September 2017. This new 5 Star beachfront property offers 257 luxurious accommodations in spacious guest Rooms, Suites or Pool Villas. Facilities at the property include a range of food and beverage outlets, 24 hour fitness centre, two outdoor pools, a kids pool, kids club and a luxury spa. A new luxury hotel in north Pattaya located close to the beach, offering 236 guest Rooms and Suites, featuring a rooftop pool, the Moon Spa and the Kitch Restaurant. This brand new Pattaya luxury residence is located just 100 metres away from Na Jomtien beach and offers 65 accommodations in Studios, one and two bedroom Suites. A new 4 star low rise hotel close to Bang Saray beach, the Santorini style property features a wide variety of room types from 30 sqm Superior Rooms to the 114 sqm 2 Bedroom Duplex Jacuzzi Rooms with a separate living area. Facilities at the hotel include an on-site restaurant, café, bar, gym and an outdoor swimming pool. A new large luxury hotel in Pattaya city centre opened in early 2017, located close to the Central Marina Shopping Arcade. A stylish new 4 star Pattaya hotel opened in December 2016 just a short walk away from the beach. This new luxury hotel in Pattaya was opened in early 2016 and is located on the beach close to the Ocean Marina Yacht Club, 10 kms south of the city centre. The property offers a total of 260 stylish guest accommodations, all with sea views. Spacious rooms start from 47 square metres, to a range of luxury suites and private pool villas. 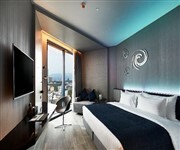 The hotel features a good choice of restaurants and bars, a luxury Spa, fitness centre and a large lagoon swimming pool. Be sure to visit this page again to find the best new hotels opening in 2019.